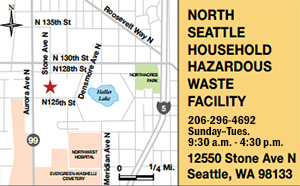 Household hazardous wastes are accepted at four fixed collection sites in Seattle and King County. In addition to these four sites, the traveling Wastemobile provides household hazardous waste collection services within many communities in King County. If you live in King County you can use any of these facilities. Disposal service is paid for in your utility bills, use it! These collection services accept waste from businesses if they qualify. See Business Hazardous Waste for more information. Hours: Sunday–Tuesday, 9:30 a.m. – 4:30 p.m.
Closed on July 4, Thanksgiving Day, Christmas Day and New Years Day. No appointment needed. There is no fee for hazardous waste disposal. It is paid for in your utility bills. Heading north on Aurora Ave. N., turn right on N. 125th St. and turn left at Stone Ave. N. The facility is half a block up Stone Ave N., on the right. Heading south on Aurora Ave. N., turn left on N.125th St. and turn left at Stone Ave. N. The facility is half a block up Stone Ave N., on the right. Heading north on I-5, take the N.130th St. exit and go west on N. 130th. Turn left on Aurora Ave. N. and go five blocks. Turn left on N. 125th St. and turn left on Stone Ave. N. The facility is half a block up Stone Ave. N., on the right. Heading south on I-5, take the N.145th St. exit and go west on N. 145th St. Turn left (south) on Aurora Ave. N. and go 15 blocks. Turn left on N. 125th St. and turn left on Stone Ave. N. The facility is half a block up Stone Ave. N., on the right. There is a special Home Collection assistance program for those King County residents unable to transport their household hazardous waste to one of the collection sites. For larger quantities or unusual wastes (except Factoria), call the Household Hazards Line, Monday to Friday, except holidays, 9:00 a.m. to 4:30 p.m. at (206) 296-4692 or toll free at 1-888-869-4233. For the Factoria HHW Drop-Off Service, there are no exceptions to these daily limits. Hours: Thursday - Saturday, 9:30 a.m. - 4:30 p.m.
No appointment needed. There is no fee for hazardous waste disposal. It is paid for in your utility bills. Take the Corson/Michigan Street Exit from Interstate 5. Turn right (west) on Michigan Street. Continue on WA-509 S/1st Ave S Bridge to WA-99/2nd Ave SW.
Continue on WA-99/2nd Ave SW.
Take the Cloverdale exit from northbound State Route 509, turn right on South Cloverdale Street. Follow the signs to the household hazardous waste facility. 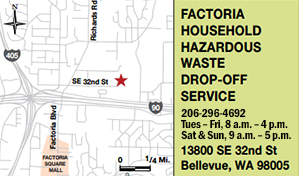 Turn left onto 2nd Ave S.
For larger quantities or unusual wastes (except Factoria), call the Household Hazards Line, Monday to Friday, except holidays, 9a.m. – 4:30p.m. at (206) 296-4692 or toll free at 1-888-869-4233. For the Factoria HHW Drop-Off Service, there are no exceptions to these daily limits. Hours: Tuesday – Friday, 8 a.m. – 4 p.m., Saturday and Sunday, 9 a.m. – 5 p.m.
Take Exit #10 (Coal Creek Parkway, Factoria). Head East on Coal Creek Parkway, get in left lane. Turn Left on Factoria Blvd SE. Turn Right on SE 32nd St, SE 32nd St. dead ends into the station. Take the SE 8th exit. Turn left (east) under I-405. Turn right on Lake Hills Connector. Turn right onto Richards Road (the first right). Turn left onto SE 32nd Street (dead ends into the transfer station). Take Exit #11 (150th Ave. SE / 156th Ave SE, 161st Ave SE). Follow signs to 156th Ave. SE. Turn Left onto SE Eastgate Way, follow SE Eastgate Way to Richards Rd. Turn Right on Richards Rd, Turn Right on SE 32nd St, SE 32nd St. dead ends into the station. Take Exit #10-B (Richards Road, Factoria), Turn Left on Richards Road, move to right lane. Turn right on SE 32nd St, SE 32nd St. dead ends into the station. There is a special Home Collection program for those King County residents unable to transport their household hazardous waste to one of the collection sites. The Factoria drop-off site is limited in the amount of hazardous waste that can be stored. If that limit is reached before the end of the day, the drop-off facility must shut down early. For questions about disposing of unusual wastes or other questions, contact the Household Hazards Line at 206-296-4692 or haz.waste@kingcounty.gov. Hours: Saturdays and Sundays, 10 a.m. – 5 p.m.
10 a.m. – 5 p.m. There is no fee for hazardous waste disposal. It is paid for in your utility bills. The Wastemobile is located in the Northwest corner of the mall parking lot off of Outlet Collection Dr. SW (next to the loading dock and Nordstrom Rack). 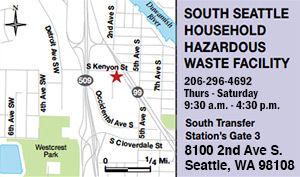 This Wastemobile service is being offered to improve hazardous waste disposal service for South King County residents. 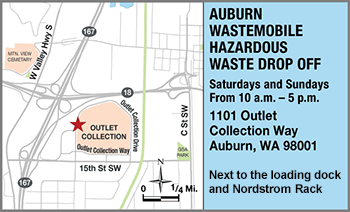 Bring your household hazardous waste to the Auburn Wastemobile on Saturdays or Sundays from 10 a.m. – 5 p.m. See what you can bring, what NOT to bring and how to safely transport hazardous materials to make your drop-off safer for you and the program staff. Contact the Household Hazards Line at 206-296-4692, toll free at 1-888-869-4233 or haz.waste@kingcounty.gov for more information about disposal options and procedures. There is also information on what happens to the hazardous waste once it is collected at all the collection sites. This service may also be used by qualified businesses and organizations that generate small volumes of hazardous waste. For information about eligibility, visit waste acceptance policies and other requirements.